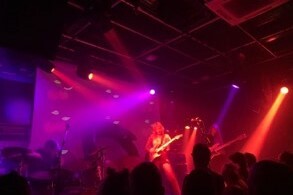 Cherry Glazerr, the indie-rock band from Los Angeles, played at Manchester’s infamous Gorilla this week, supported by three-piece indie-pop band Peaness. The stage was set with a giant inflatable cherry and the visuals on the screen created a grungy vibe which added to the dark and all-encompassing atmosphere of Gorilla. Beams of light lit up the band darting on lead vocalist Clementine Creevy as she ran up and down the stage with passion. The band were electric, but the crowd did not live up to this energy, preferring the slower and more well-known songs. Their most famous song, ‘Had Ten Dollaz’, raised the whole crowd’s spirits up as they began playing their opening songs and introduced the trio’s captivating style and stage presence. People sang along to the lyrics “I know that you notice my ways, and I feel, I feel your gaze”. This accurately summed up the crowd’s enchantment towards the band, not losing focus the entire gig. Although the energy of the audience was not constantly in sync, the attention towards Cherry Glazerr was never disappointing. The lights during ‘Self-explained’ glistened purple and red, giving a mellow romantic scene which matched the song perfectly. This was accompanied with cool visuals of growing and transforming mandala-style patterns. Everyone seemed content to sway along to the slower songs, giving way to an enjoyable atmosphere during these. The amped up, rock-side of the band was embraced during ‘Juicy Socks’ and ‘Wasted Nun’, the drummer Tabor Allen providing the pulsing beat throughout. With a nod to their album Apocalipstick, they played the album’s namesake with all the angst and energy I’ve always loved the band for. Another highlight was one of their newest hits ‘Daddi’, which they released alongside the November announcement of their newest album (released February 1st, 2019) as a taster for the more experimental sound of Stuffed & Ready. Cherry Glazerr finished with two more songs following an encore, featuring a cover of LCD Sound System’s ‘Time to get away’ which was a pleasant and welcome surprise. This was followed by another hit single and their last song ‘I told you I’d be with the guys’. By this point, the atmosphere in the crowd had hit a peak, and everyone showed more energy than ever. They left the stage quite abruptly, but this just added to the dark yet charming atmosphere of the evening. Cherry Glazerr amazed me with their evening of cool lights and eccentric energy. Impressively, the slower crowd did not effect the performance of Clementine, and she was no less energetic towards the end than as when she began. Cherry Glazerr may perhaps be a band for more small, intimate gig venues, but they were complimented by the dark atmosphere that Gorilla provides and made full use of the visuals. They are certainly a must see if you are looking for an evening full of non-stop electricity and enjoyment.